As a newcomer to the radio control flying hobby, choosing and buying your rc plane correctly is going to have a big impact on your initial enjoyment of radio control flying. Why? Simply because if you buy an airplane that's not suitable for a beginner, or is of poor quality, you'll have a nasty first experience with it and you'll very likely be put off rc flying for life - so please don't let that happen! For your first radio control plane you need something that is stable and forgiving. This is so important, and many beginners are too tempted to buy an rc plane that looks cool or can fly fast, without giving much thought to how easy the thing is to control. Big mistake! The perfect airplane to learn to fly on is a high wing trainer. By 'high wing' we mean that the wing sits on top of the fuselage, and this configuration means lots of stability in the air - exactly what you need when learning to fly radio control. High wing airplanes are stable and forgiving because the weight of the fuselage below the wing always acts to stabilise the airplane in flight. A high wing plane will always want to right itself naturally after a turn and this action really helps you out when learning to fly. The other thing you need to look for when buying your first rc airplane is noticeable dihedral. This is the upward 'V' angle of the wings when viewed from the front. The more dihedral the wings have, the more stable the airplane is going to be (up to a point). Again, this is because of the 'pendulum' effect of the fuselage hanging below the wing; the lower the centre of gravity is in relation to the wing surfaces, the more stability there is. when viewed from the front. Another reason for dihedral is that airplanes without ailerons (i.e. they rely solely on rudder for turning) need dihedral to aid the turn. As rudder is applied, the plane yaws to that direction and the dihedral then forces the plane in to a banked turn. That's an over-simplified version of events, but it's called Dihedral Effect. RC airplanes that do have ailerons will have noticeably less dihedral than those without, as a general rule. So then, for your first rc airplane you should be looking for a high wing configuration with good dihedral - the classic 'trainer' design. EP rc airplanes are a lot more beginner friendly; they are cheaper to buy and to fly, they require less accessories, they have less of a nuisance factor because they are quieter, and they are more welcome in public places (where rc flying is permitted, of course). Conversely, a glow plug powered plane (or any IC one) requires more accessories because of starting and maintaining the engine, you'll have ongoing fuel costs, they generate much higher noise levels and are, generally speaking, larger and more expensive than EP beginner planes. Club membership and access to a proper flying site or private land is more of a requirement with an IC powered plane, since they are not as welcome in public places because of the noise. So if you're on the fence and can't decide which power type to go for, go with electric - you'll have an easier, cheaper and cleaner introduction to the hobby of radio control flying. There's no question about that. If you love the smell of burned fuel and the noise of an engine, go with IC. More thoughts on IC vs. EP. How many channels (controllable functions)? This is an important question and, again, choosing badly could determine how much fun you have with your new rc airplane. For the simpler 'Park Flyer' type electric rc airplanes (the ones we're focusing on in this flight school) 3-channel planes are most common for self-teaching. Single and 2-channel rc airplanes are available but they are more toys than anything else, and not worth spending any money on if you're serious about the hobby. A 2-channel rc airplane is easy to fly but very limited in what it can do. So, for a true taste of radio control flying, a 3-channel plane is what you really need. A 3-channel plane will have control to motor, elevator and rudder although an optional configuration is motor, elevator and ailerons. 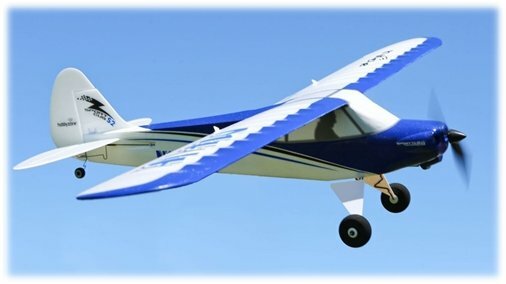 A rudder is more commonplace on beginner rc airplanes though - ailerons tend to be on faster planes capable of more aerobatics, where they need the capability to roll smoothly - which aileron control gives. Of course, there's nothing stopping you diving right in with a 4-channel trainer such as the E-flite Apprentice 15e, for example. Such an rc airplane isn't quite as straightforward to self-teach with but ultimately they are more rewarding to fly. Plenty of beginner rc pilots have started their journey with a 4-channel trainer. A 4-channel plane will have control to motor power, ailerons, rudder and elevator - that extra channel (ailerons) does steepen the learning curve somewhat because of the extra co-ordination needed, that's why self-teaching on such a plane isn't as easy as on a 3-channel one. electric RTF rc airplanes - 2, 3 & 4 channels respectively and all meant for beginners. For the purpose of this RC Airplane World Flight School though, we'll stick with a 3-channel airplane with motor, elevator and rudder control, something like HobbyZone's Sport Cub S.
The 'completeness' of your first rc airplane is purely down to your own personal preference. A kit involves building the plane from a box of pieces over a plan. Very satisfying, but you need a fair knowledge of model building skills to do it well and you'll need to buy the motor, ESC, battery pack and radio gear separately. Unless you really want a traditionally constructed balsa/ply trainer as your first plane, it's not advisable. Learn to fly first before risking the horrors of crashing a plane that's taken you much time and effort to build! If you buy an ARF (Almost Ready to Fly) rc airplane it will be about 90% finished. You just need to buy the motor, ESC, battery pack and radio gear separately and install it all yourself. Again, some modelling knowledge is required but there won't be much building to worry about. ARFs make an excellent introduction to model airplane construction, if you do want to get involved in that side of the hobby as well as the flying (learn more about ARFs). Buying an RTF (Ready To Fly) plane is your best option if you just want to get flying in the least amount of time. RTF rc airplanes come fully finished with all electronics (motor & radio) installed. There's nothing for you to do apart from some very basic assembly work (eg attaching wing to fuselage), charge the battery pack, install the transmitter batteries and fly. REALITY CHECK : it's a fact of the radio control flying hobby that crashing is all part of the action! When you're learning how to fly rc airplanes the chances are good that you will crash sooner or later - and if you're a complete newbie, then it'll probably be sooner. Having an off-the-shelf supply of spare parts is very convenient, and when you're looking around at buying your first rc airplane do take the time to check whether spare parts are available. Certainly brands such as HobbyZone and ParkZone, for example, carry all the parts you could wish for. Generally speaking, spare parts for foam RTFs are quite cheap - much cheaper than parts for a balsa/ply plane. If you buy an rc airplane that doesn't have a good back-up of parts behind it then you're in for some potentially dodgy repairs that could seriously impede the safety and performance of your plane, post-crash. If you've got a local hobby store, the best thing you can do is pop along and have a chat. My website will give you all the info you need to understand what you should be buying, but talking face to face with an rc enthusiast is better. And helping support your LHS is the right thing to do - many many rc shops have gone out of business in recent times due to low profit margins and tough competition. But beware! There are some unscrupulous shop owners out there who are interested in nothing more than getting hold of your hard-earned cash - they might not have your best interests at heart when it comes to you actually learning to fly. Selling a newbie something expensive and completely unsuitable sadly happens from time to time. Buying online is your other option and that's perfectly acceptable. Stay close to the advice and info in this page and the website in general and you won't go far wrong. But again, be careful - we all know the internet is a minefield. And then of course there's good ol' eBay, but don't be tempted to buy something cheap and nasty from China or Hong Kong from a brand you've never heard of, just because the price is too good to be true (if it is, then it probably is!). If in doubt research the airplane you're thinking of buying - ask around, check forums, check out videos of it on YouTube - in short, just be aware of exactly what you're buying, and from who. Well the above pointers should give you an idea of what to look for in your first plane. If you want more detailed information on the above, and getting in to rc flying in general, check out my popular ebook The Beginner's Guide To Flying RC Airplanes. Next up: Lesson 2 - Get to know your rc airplane. Take off / hand launch.